Dr. Rock's Blog & Roll: Album of the Day: The Beatles (5/8/70) 40 Years! Album of the Day: The Beatles (5/8/70) 40 Years! The Beatles had broken up for good several months before Let It Be was released on May 8, 1970. And, while it is sequentially their last release, the music on Let It Be was actually recorded in January 1969, before the sessions that led to Abbey Road, so it really isn’t the Beatles last album per se. Either way, Let it Be is not a fitting swan song. It’s one of their weaker efforts and reflects the turmoil that was rending the band apart in their final year as a unit. Let It Be does contain several gems (“Get Back,” “Across The Universe,” “Dig A Pony” and the title track are keepers), but they can’t hide a handful of disappointing throw-aways and an overdone Phil Spector production of “The Long And Winding Road.” Three of the tracks on Let It Be, “Dig A Pony,” “One After 909” and “I’ve Got A Feeling” were recorded during the famous rooftop, impromptu concert for family, friends and Apple Studios employees on January 30, 1969. Of the three rooftop tracks, only “Dig A Pony” has any value; the other two were more a novelty and evidence the loose nature of the “live” appearance. The tail end of the Let It Be sessions and the brief outdoor show included Billy Preston, whom George Harrison brought in as a condition for returning after he walked out of the studio in frustration earlier in the month. Preston’s presence was a calming influence on the proceedings, and the band completed the tapes in February 1969 and moved onto Abbey Road, which came out in September 1969. All in, Let It Be is not a great album, but it’s worth having in your Beatles collection. 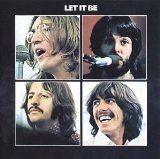 There are two Beatles playlists in the Playlist Vault and Let It Be is on Amazon (but not yet on iTunes).